Communities@Work is calling on Canberrans to take some time during Children’s Week to be reminded of, and to reflect on the rights of the child. Children’s Week, October 2016 — Communities@Work is calling on Canberrans to take some time during Children’s Week to be reminded of, and to reflect on the rights of the child. “With almost 40 years of experience in providing children’s services for families in the Canberra region, we embrace the notion of childhood and believe that all children have rights,” said the CEO of Communities@Work, Mr Lorcan Murphy. Provision – Communities@Work advocates and supports that every child in Canberra has the right to the provision of the best possible education and care services. To this end, we continuously strive for excellence at our 13 child care centres, within our 100-strong Family Day Care scheme and at our 18 out of school hours care programs. Additionally, we have taken a very innovative approach to educational leadership and appointed a number of educational leaders who work exclusively across multiple sites to support the development of pedagogy and curriculum, and create optimum learning environments for children. Protection – Our focus is to ensure that each and every child feels valued, special and secure and is given opportunities for reaching their full potential. Our services offer a wide range of environments from small boutique to larger purpose built facilities. Our active learning environments support the growth and development of the whole child and provides children with a sense of belonging. 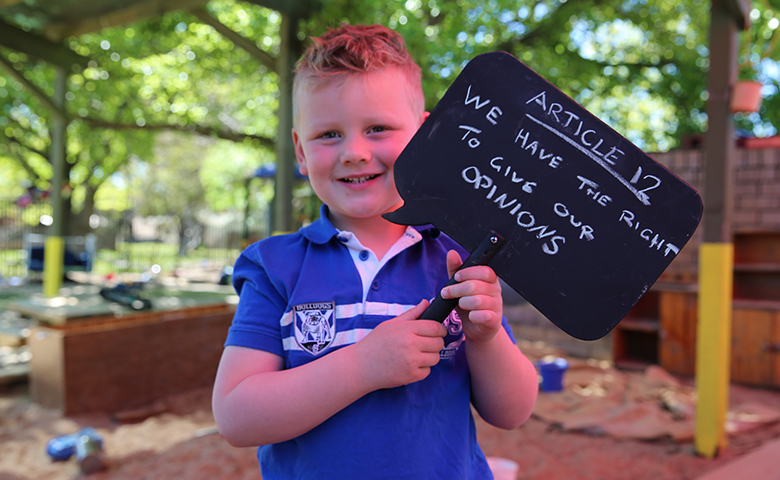 Participation – We believe that each child has a voice, and their voices help shape their curriculum and learning journey. We understand that children have the right to participate in and influence decision-making that may be applicable to their lives (UNCRC, 1989). We actively support each child to exercise choice, have their views valued and respected and participate as active members of society, shaping their environment and engaging with the world around them (Landsdown, 2005). This Article draws attention to the important role that all forms of media, e.g. television, social media, magazines, radio have in providing information that children can understand and trust, and to protect children from potentially harmful information. It also highlights the importance of children having access to material from a diverse range of sources, especially material aimed at the promotion of children’s social and cultural well-being. “We are committed to ensuring that the material we provide to children reflects their emerging capacities and interests, is socially and educationally beneficial, and reflects the diversities of children’s circumstances, culture and language. We are conscious of the need to be respectful and sensitive to the cultural backgrounds of all families and to encourage children to embrace the customs and traditions of different cultures, and very importantly the cultures of indigenous and minority groups within the community”, Mr Murphy added. Communities@Work is building a culture of excellence across all of its children’s services, including child care and education centres, out of school hours care programs and family day care. This culture of excellence is characterised by a strong emphasis on the rights of the child, fostering educational leadership, building meaningful relationships with children and families, and empowering quality educators. Communities@Work is a broad-based social enterprise serving the community in the ACT and wider capital region. Offering choice and flexibility across numerous centres and sites, we are a leading provider of children’s services. We are a Registered Training Organisation (RTO 88148) offering qualifications and professional development in early education and care. Our surplus for purpose philosophy enables us to provide valuable community support services to seniors, people with a disability and the most vulnerable and disadvantaged members of our community. • Lansdown, G. (2005). Can you hear me? The right of young children to participate in the decisions affecting them. The Netherlands: Bernard Van Leer Foundation.